Viruses are extremely simple "life" forms without metabolic capacity, organelles, translational machinery, or autonomous replicative potential; the essential elements of a virus are consequently minimal. Virus particles are either enveloped or nonenveloped. Enveloped viruses contain one or more envelope glycoproteins embedded in a lipid bilayer that is acquired by budding through host cell membranes. Nonenveloped viruses are made up of a tight protein shell. In both kinds of viral particles, the envelope or protein shell serves to protect the viral genome from the hazardous extracellular environment, since without such protection, the fragile nucleic acid genome would be vulnerable to physical, chemical, and/or enzymatic destruction. Surface proteins also harbor functions required for virus entry into host cells. Inside the virus particle, the viral genome is associated with one or more proteins to form a complex usually referred to as the nucleocapsid. In addition to nucleic acid binding proteins, some viruses also carry enzymes required to initiate replication (like polymerases). Although not all virus particles are highly structured, two kinds of symmetry are common. Helical symmetry is reflected by the arrangement of the protein subunits in a "spring-like" or stacked lockwasher fashion, whereas icosahedral symmetry comprises 20 triangular faces that form the surface of a sphere. In the simplest icosahedral capsid, one protein subunit is at each triangular point of the 20 faces, requiring 60 total subunits. 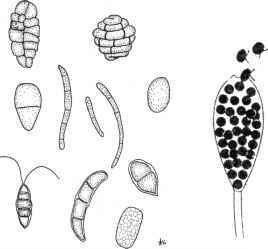 While host organisms use only DNA for their genetic material, a viral genome may be composed of either DNA or RNA. The size of viral genomes varies greatly. The genome of variola major, the DNA virus that causes smallpox, is 190 kb. The RNA genome of the SARS-causing coronavirus is 29.7 kb; those of Ebola and Marburg viruses are each 19 kb, while the HIV and poliovirus are 9.2 kb and 7.4 kb, respectively. 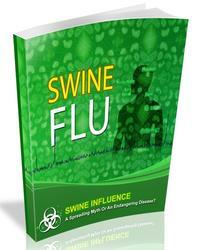 SWINE INFLUENZA frightening you? CONCERNED about the health implications? Coughs and Sneezes Spread Diseases! Stop The Swine Flu from Spreading. Follow the advice to keep your family and friends safe from this virus and not become another victim. These simple cost free guidelines will help you to protect yourself from the swine flu.